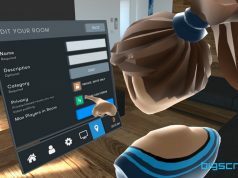 Bigscreen is a social VR app which lets VR users bring their PC desktops into virtual reality, as if sitting at their computer next to friends or co-workers. Users inside of Bigscreen can see each other’s desktops which means you can watch movies or play games together. With Bigscreen still in beta, the streaming functionality has been hit or miss, but a new update promises to bring “flawless” 1080p streaming at 30 FPS to everyone. Update (7/25/17): We got a chance to try out Bigscreen’s promised 1080p 30 FPS video streaming. While we can’t profess to have run any type of reliable metric to see empirically if it was working as advertised, visually there was little discernible difference between locally played 1080p 30FPS content (i.e. the verifiable target fidelity) and content streamed between two people. Whether it was watching two other people stream video contemporaneously in split-screen mode on the 100-foot cinema screen, or sharing smaller personal screens while sitting next to each other—it seemed to conform to the level of visual fidelity we expected. That said, minor hiccups did occur once or twice during initial video buffering where locally displayed video was superior to streamed video including a few dropped frames that we estimate dipped into 15-20 FPS territory, but over the course of testing several videos we saw these issues as few and far between. We were also told that there are still outstanding issues regarding global desktop audio, but we didn’t encounter anything during our demo—both with and without the Bigscreen staff—that would suggest anything showstopping. Tests were conducted with users chatting between California and Europe. 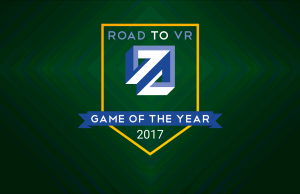 The patch will be available today for Rift through the Oculus Store and HTC Vive and Rift through Steam. For those interested in helping to test the update ahead of the launch, Bigscreen invites you to join the Bigscreen Community chat server on Discord and join the private alpha test. The original article continues below. 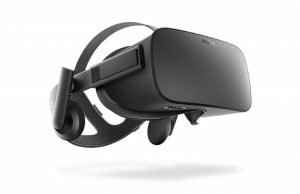 Original Article (7/7/17): Your computer can do a million things—browse the web, watch YouTube, edit movies, create documents, send email, play games, and on and on—what if you could just bring your PC into virtual reality and join up with friends? Then you’d be in a room with your friends and their PCs, which can also do a million things. That’s the surprisingly simple idea that makes Bigscreen magical. But, making it happen relies on being able to stream desktops between each user with solid performance. 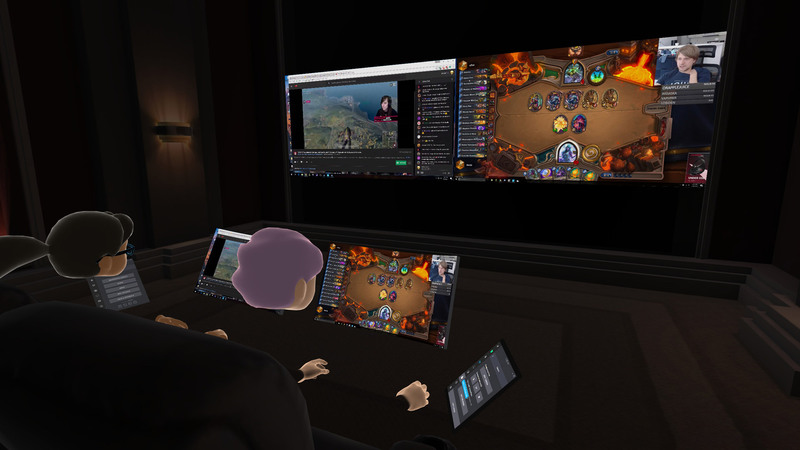 For many users using Bigscreen’s multiplayer mode, streaming screens has been sub-par, making desirable social activities like watching Netflix or playing games with friends impossible due to choppy framerates which could often look more like slideshows than moving video. We’ve spent the past year rewriting our media engine and networking stack from scratch. 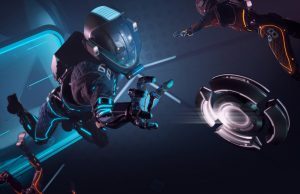 Our new technology takes advantage of Nvidia and AMD graphics cards for hardware accelerated encoding and decoding, enabling flawless 1080p30 streaming for all Bigscreen Multiplayer users. Previously, Bigscreen multiplayer would perform poorly for some users and consume 80-100% of CPU. Our new tech doesn’t use the CPU or GPU resources that games use, and instead uses the dedicated video acceleration chips on the graphics cards. It’s a massive increase in performance and functionality. 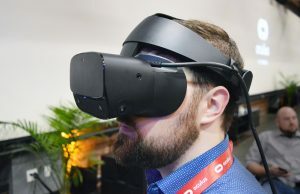 The performance enhancements brought by the new streaming tech will do more than just make your friend’s screen smooth, it will also open the door to raising the current limitation of four users per room. 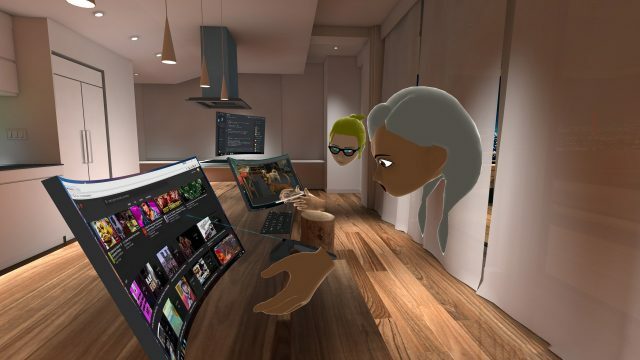 Shankar says that another update following the streaming overhaul (in the next one or two months) will enable rooms supporting somewhere between 6 to 10 users at a time, and maybe even more down the road. 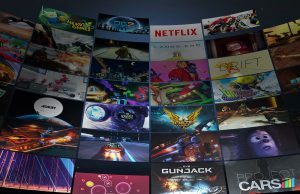 Bigscreen users who use the app in single player as a VR desktop environment also have something to look forward to: optimizations from the overhaul can “reduce CPU usage by 50% and reduce GPU usage in some environments by 60%,” Shankar says. I love this direction. 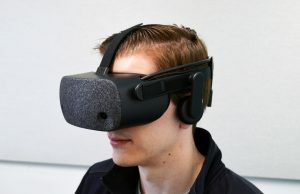 From a business perspective If you are an IT worker then working in a VR room instead of driving to work has many benefits. Staff can be all over the world, no need to drive to work (saving pollution, travel costs). 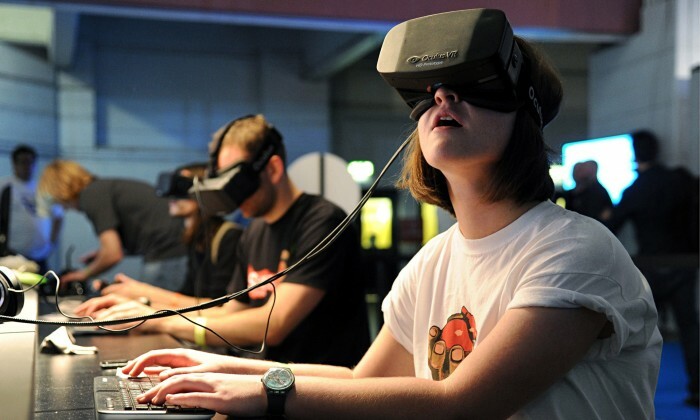 Managers could pop in and out of staff VR rooms at will. Real office expenses would be slashed massively as users would be working from home. Meetings could be set up almost instantly and are global. Design feedback, training and productivity would rise. Clients could pop in instantly to review work from multiple workers etc. It is definitely a foreseeable future. It’s all great except typing is a real issue. 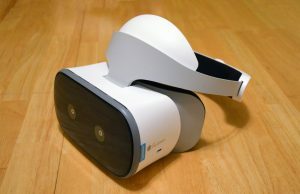 This is where something like leap motion would be amazing. There is a virtual keyboard that you can toggle for typing. This needs to happen! The local governments should offer tax incentives to encourage telecommuting. It’s a LOT easier and cheaper than building roads and it makes no sense to drive across town just to sit at a desk when you could do it at home. Companies would save on office space and utilities. It’s a win-win. They would also save a lot on labor costs, as they can then outsource your job to a country with much cheaper labor rates, just like they already do for tech support call centers. And there’d be no need to hire expensive North American or European workers when for the same price, companies can hire multiple workers from countries like India or the Philippines without even having to bother with a work visa. Why hire locally when a worker from southeast Asia will work for 1/5 the cost and thanks to telepresence is “virtually there”? I guess there is still language barriers, time zones differences and other factors but yes, cheap IT Labour would become even more accessible. One answer to that problem in your own part of the world is to specialise in an area or become the employer yourself. Or simply get out of the digital workplace if it gets too saturated. The real problem with this idea, speaking as someone in the IT field as a senior solution designer and developer, is that you get what you pay for. I’ve had to come into countless projects where cheap labour was used, and had to rewrite the entire thing. It may be fine for tiny projects, but as soon as it’s mission critical or complex, you’re just asking for trouble. Cutting corners in software development leads to technical debt that will come back to haunt you. There’s a saying in the field that has proven true time and again. Cheap, high quality, fast. Pick two. Yet another way to explore underpaid labour… YAY!!!! 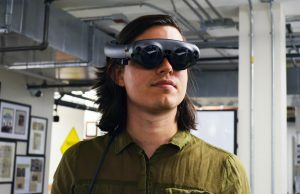 Even if we chose to use hardware in VR mode at times by shuttering out the real world as best we can with HMDs and headphones; aren’t we REALLY looking for AR? not at all for this use case, unless you want to sit in an office by yourself with empty desk/cinema and populate them using AR. The point is you can be anywhere with anyone at any time. I don’t think that’s what you meant so I put it that way to clarify my point. 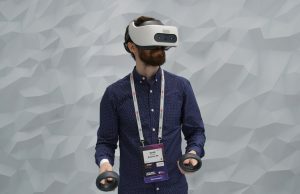 Sure when we can’t be around people for real, virtually is the next best thing, but VR will get between us and real people where AR can provide the best of both worlds. 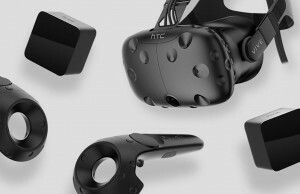 Hence, “aren’t we REALLY looking for AR?” Furthermore, my point was that with the AR hardware I’m referring to, we get VR also while with VR, you have to choose between one or the other. 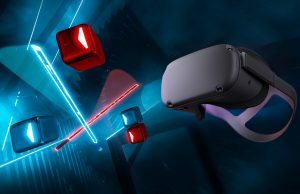 I would love to have something like this on PSVR!!! 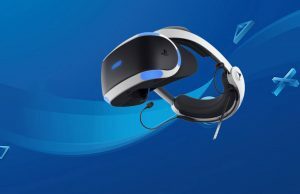 Have used it in the past with my Vive, however social gaming on the PSVR would be GREAT!!! 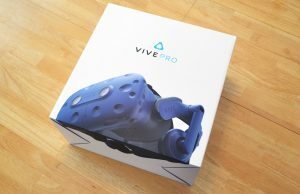 Bigscreen is AWESOME, I’ve tried it, but the resolution on the Vive and Rift is just way too low for this purpose yet. I spend most of my time squinting and trying to read characters and recognize icons. I briefly tried Bigscreen on a PIMAX 4K and it was WAY better, but it still needs to get a bit sharper before text is clearly readable. 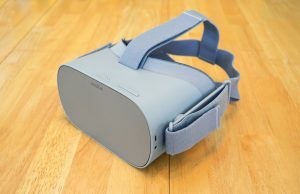 I can read text just fine on my Rift. Could it be better? Of course! But I honestly haven’t been having too much trouble with text, overall. Oh how exciting!!! Can’t wait! Big Screen is probably my most used app, I use it A LOOOOOT. The thing I’ve been waiting for the most is to have more users in a room. 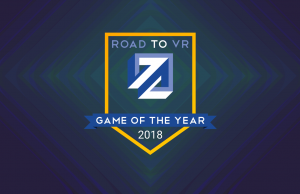 I keep imaging how amazing it would be to be able to watch a fighting game tournament (watched Evo2017 in a VR theater and it was amazing), or any other thing of that nature with a bunch of friends ‘together’. 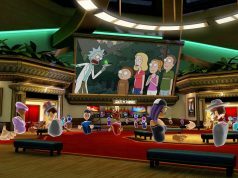 Watching movies and sitting with other people is one of the most amazing experiences I’ve had in VR so far. 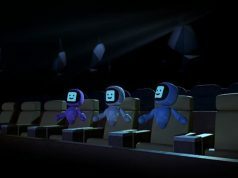 I wish I could use some of the theater locales from the Oculus Video app (or they had multiplayer support as well as a more thorough Twitch integration), being able to sit with even 8 people would be amazing. I want to see an IMAX screen, hope that was implemented today. This is amazing. I hope they add alot more virtual rooms, they already have a lot but the more the better. Hopefully more people will be able to join a room in future too. Lots of fun.